I think we are preconditioned to be clean and tidy after years of growing up and parents telling us we mustn’t make a mess or untidy this that and the other and the good thing about this playgroup is I think this turns that on its head. It helps us parents let go a bit and get stuck in. Truly Madly Messy is run by Natalie and Louise, who made me feel very welcome. As parents themselves igood to know that they can relate to the needs, stresses, strains and general hoohaa that being a parent entails. Great for babies who are not walking yet and brilliant for inquisitive toddler. My little one who is 16 months loved it and got stuck in almost immediately! It was our first visit, but judging by all the facebook photos they do vary the messy themes every week. Every activity was safe for babies and toddlers if they put anything in their mouth. Which was a relief as everything seems to end up there! even the sand was handmade from flour and vegetable oil. My little one also played with bubbly water, beans and mash potato, hanging out the washing on the washing line, chalk and painting. After the kids have had lots of messy fun, its a relatively quick clean up, a biscuit and story time for the kids and a well earned tea or coffee for the adults. Only difficulty there is trying to stop the kids from going back in the mess after getting cleaned up, but Natalie and Louise were on the case and were soon to start cleaning up once the babes were all sparkly again. There are possible plans for the local pub next door to start kid friendly lunches with craft activities so parents can meet up after the playgroup – so watch this space. There is a clean up station to cope with the messy aftermath, with face clothes, warm water and soap, which is useful and a nice idea. I think its a bit like swimming, be organised have a change of clothes ready and it will all go to plan. A change of clothes ( including socks) is a must, not forgetting to take their shoes off. The paint does stain clothes so dont put them in any clothes you care about! Also dont wear anything yourself that you mind getting messy, as my little lad was covered in paint and then decided to give me a big hug!! you guess what happened! They do run a loyalty card scheme, so everytime you visit you get a stamp and if you visit 10 times you get a free visit. 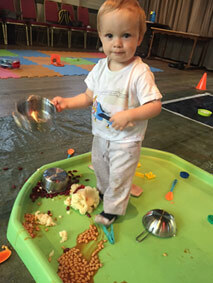 It is a lovely opportunity for kids to explore getting down right messy! Although it leans towards the more expensive playgroups, it’s well worth it as you get all the messy fun without any of the clearing up!! and dont forget to mention you saw this review on The Daily Toddler or you spoke to Sam! 1 Comments: "A messy extravaganza at Truly Madly Messy"